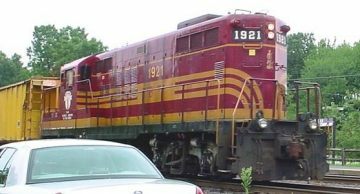 One of my first railfan shots, taken at Lincoln MA in 2003. 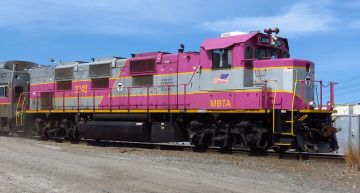 MBTA work engine #1921 was a GP9 painted in B&M colors in memorium of a loyal employee. Known locally as the "T", the MBTA operates daily commuter trains in and out of Boston MA, as well as the country's oldest subway (that's right, older than New York's!). 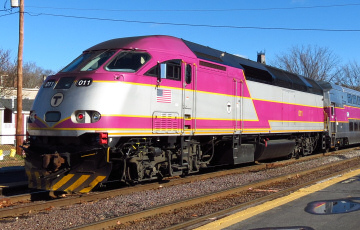 There are many commuter train lines, some running on ex-B&M, Old Colony, and New Haven routes. 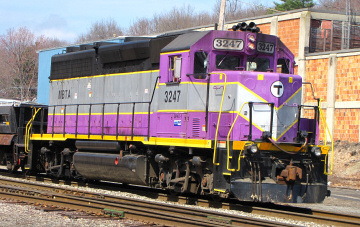 Engines are painted grey (silver), black, and purple with yellow trim. Trains are run push-pull thanks to control-cab units in the rear. Some lines run bi-level coaches. 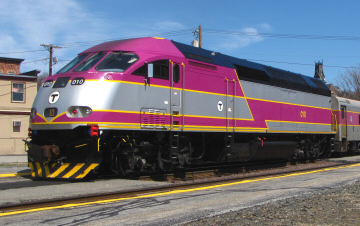 In 2011, the MBTA purchased their first new diesel locomotives since arrival of the F40s. 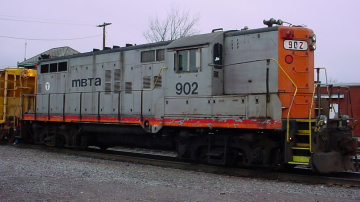 These were two MP36PH-3C units, which were numbered 010 & 011. They had been ordered by Utah Transit Authority, but never used. The MBTA granted a contract to Hyundai-Rotem for bi-level coaches. They were designed by the Korean company, and assembled from kits in the USA They didn't start arriving until very late 2012/early 2013. There were severe delays in delivery of these coaches due to shoddy workmanship and material shortage. The MBTA was very vocal in their complains toward Hyundai-Rotem. 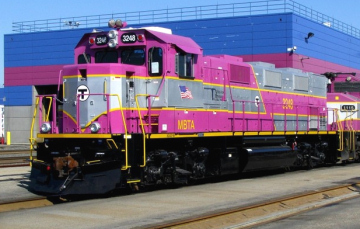 Starting in mid-2014 the MBTA took delivery of the first truly brand new locomotives since the F40s. The T decided to order MPI HSP46 locos with GE diesel engines, a departure from many years of EMD power. It was discovered that some traction motor bearings had been shipped improperly to their factory, causing failures. 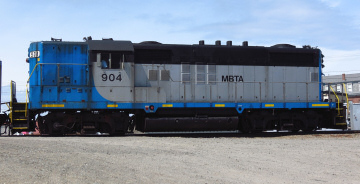 Locomotives already delivered to the MBTA were repaired on site, while half of the locomotives were redirected to Altoona Works during delivery for replacement bearings to be installed under warranty.